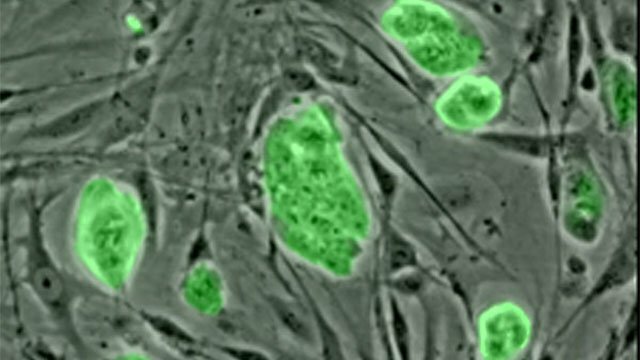 Scientists can now easily make mouse cells that act just like these mouse embryonic stem cells (in green). This opens the field wide open. Image courtesy of Wikimedia Commons. A group of Chinese scientists has come up with a chemical way to turn regular old mouse cells into cells that act just like embryonic stem (ES) cells. This finding has the potential to unleash the awesome potential of ES cells without any of the moral baggage and/or health risks usually associated with them. Since it is easy to standardize a procedure based on chemistry, this finding may take ES cells from the boutique to the factory floor. 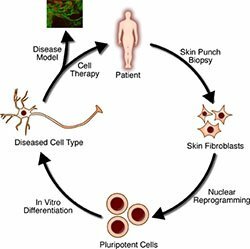 And any ES cell therapies that eventually come to fruition could become more widely available. Embryonic stem (ES) cells have been touted as a potential treatment/cure for health issues as diverse as spinal cord injuries, diabetes and lots of things in between. ES cells are the ones found in an embryo that can go on to become every other kind of cell in an adult body. The idea behind the utility of ES cells is that once we learn the tricks of transforming them into what we want, we can coax them into becoming cells that can replace diseased or damaged tissue. So we might turn ES cells into new Islets of Langerhan in the pancreases of people with Type 1 diabetes, or into new nerve tissue to repair a spine, or new heart tissue to heal a heart after a heart attack or…the sky is the limit! Unfortunately, these finicky cells have failed to live up to the hype so far. Now this isn’t because they aren’t going to be useful one day. They will. It's just really hard to figure out how to get ES cells to do what scientists want them to do. And this is made even more difficult by the limited funding ES cell research gets. The reason funding is so scarce is that up until a few years ago, scientists needed to destroy an embryo to get ES cells for their research. Anyone who thinks that life begins at conception is obviously going to be opposed to this sort of research. Ending a life to save others is not a deal many people are willing to make. Another problem with ES cells is that that they come from someone else. This means that anyone getting treated with ES cells would have all the problems that anyone with an organ transplant has. For example, they’d need to take drugs for the rest of their lives that weakened their immune system. Obviously better than being sick or dead but hardly ideal. Here's how to make ES-like cells without destroying an embryo. Image courtesy of Wikimedia Commons. One way around this last problem is to simply clone the patient. You would grow the clone up to a few cells, harvest the ES cells and destroy the clone. You’d still have the problem of destroying an embryo (and somehow destroying a clone seems even worse), but you’d have personalized cells. Not surprisingly, this approach has yet to catch on. In 2012, Dr. Shinya Yamanaka received a Nobel Prize for showing us how to create personalized ES-like cells that did not involve destroying an embryo. His approach was to reprogram the DNA of an adult cell so that it reverted back to being an ES cell. To distinguish these cells from true ES ones, they were christened with the name induced pluripotent stem (iPS) cells. He and members of his lab accomplished this by adding four genes to a mouse cell. Other scientists were able to show that the same thing worked in people. This is obviously groundbreaking stuff. Except for one little problem—these cells tend to turn cancerous when put into animals. In some ways, this side effect isn’t surprising. The scientists added genes that were all incredibly powerful and known to be involved in cancer. But you need something that powerful to have such a profound effect on a cell. Scientists have managed to tweak things a bit to make the process easier and a bit less dangerous. They found ways to add fewer genes and even managed to get it done with just the products of the four genes. But none of these were great options, which is why the latest study by Hou and coworkers is such a big deal. The four genes that scientists add to turn a cell into an iPS cell are already there. What Hou and coworkers did was to identify small chemical compounds that could turn these genes on for a short time. The idea is that you’d get a burst of activity from these genes which would reprogram the cells, but then the gene would shut off once the cells developed into the tissue you want. This mimics what happens in real ES cells and would hypothetically pose a much smaller risk for cancer. And this turned out to be true. After screening over 10,000 compounds, the authors settled on a cocktail that was as good as any other established methods in turning adult cells into iPS cells. And when they were placed in a mouse embryo, they went on to become part of the mouse, developing into lots of different tissues. None of the cells derived from these iPS cells turned cancerous. We may finally have a safe way to make personalized ES cells. Since this is a chemical method, it should be pretty easy to standardize and do on a larger scale. That means that if this pans out in humans (and everything with iPS cells pretty much has so far), then personalized iPS cells may become something most everyone can get. Talk about a medical revolution.